For those fed up with the pitfalls of individual language exchanges or who just want a quick, informal way to broaden their social circle, Friends in Korea is there to help. David Lund and Daniel Kim founded the group in 2004 to connect expats with locals. It now hosts about 25 events each month. Kim started the international parties on a monthly basis, said Lund. “We’ve been close friends for about 10 years now, so naturally when Daniel’s original parties grew, we started to work together,” he said. 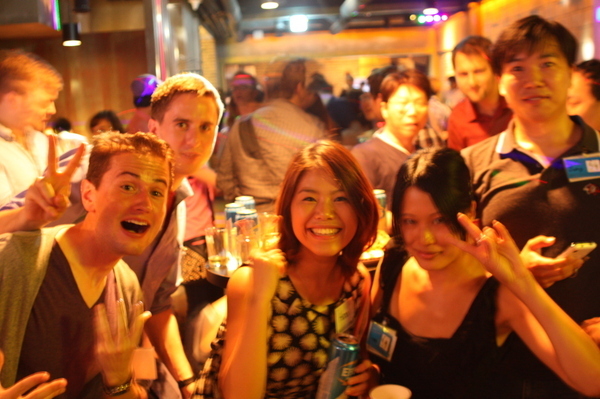 Today, Friends in Korea provides language exchange programs and international parties every week. There is also a speed-dating event held every two months. The language exchange cafes are hosted simultaneously in Hongdae and Gangnam. On Wednesdays, the cafe is from 7-10 p.m. The meeting on Sunday takes place from 3-6 p.m.
About 40 to 100 people attend each gathering, depending on the location and the day. Additionally, every Friday and Saturday there are international parties held at different places around the city. The events start in bars or cafes, and afterward move on to a club. Lund and Kim vary the locations of the parties every month. They have been held in Gangnam, Hongdae, Itaewon and Sinchon, and about 100-150 people come to each party. “Some people feel comfortable to party and make friends then, while others enjoy a calm atmosphere more,” said Lund. The speed-dating event was launched two years ago and was designed for 40-50 single men and women ages 21-39. “But most people that come are in their mid-20s or early 30s,” Lund said. All events are aimed at expatriates, locals and tourists to support international friendships. “We have exchange students, local students, businesspeople, people in their 20s, 30s and even 40s who attend our events regularly,” Lund said. Each language cafe meeting costs 10,000 won. The parties also cost 10,000 won for men, while women have free entrance. The costs cover snacks and entrance to a club. For more information, visit friendsinkorea.com.